What are the best Toe stops for quad speed skates? I'm kind of opening a can of worms here. I've been researching and looking at Crazy Skates Big Bloc, Sure-Grip Shock Stops and Gumball Superball Toe Stops. I'm not sure what to do. I'm trying to avoid buyers remorse. I skate indoors and I'm currently stopping with my original black Huggers which have aged and seem hard due to slipping when stepping off on them while on the skate floor. I've noticed that the sizes of the new stops I mentioned are larger than what I have which is one of the benefits I kind of like for stability. I don't know how things have changed with how the materials used are made, I just remember a stop having some cushion, bite and being made of rubber. Any advice, thoughts and input is appreciated. Last edited by idiveintoit; July 5th, 2016 at 01:58 AM. Toe stops similar to Huggers are still available. Thanks for the link. I did see stops simular to my Huggers but I noticed the larger sized stops which do appeal to me. I also noticed the different materials used and I'm curious to advantages and disadvantages, such as longevity and durability. I've heard that some stops just disintegrate. I have been out of skating a long time and I have no clue as to the quality of today's toe stops. Someone else will have to respond to that. Thank you Nostalgic, I'm in the same boat. There have been changes and I appreciate any advice and information. Wish they came in more colors though. If your just using them to stop go for the cooolest looking. Derrick, there are so many stops that look great but looks aren't everyrhing, they must function well and be of great quality. Keep on rollin. What's the point in having toe stops on speed skates ? Maybe this was meant to go into the quad forum for general purpose quad skating? I use toestops for indoor speed for starts. They're often good for couple of placements going into the first corner. That said, I like the SureGrip cutaways because they're light and have the right angle for my style. Nothing about stability, which often includes heavier toestops with a larger footprint that can interfere with wheels. There are some old stock ones that are terrible (crumbly and slippery), but the pair I have grips just fine. They wear out a bit quick. I found the Gumball V2 work well for derby after a couple of practices to wear them down. They're a bit bouncier than the Suregrips. They're quite a bit bigger for stability, and they're lasting a lot longer. This question needs to be more specific. First off, it is not the style of skates ("quad speed skates") that determines what the best toe stops will be, but rather it is the KIND OF SKATING. Assuming speed skates are used for actualspeed skating - as in racing - then no toe stop is the more normal setup. However when a speed skater still deems toe stops to be a necessity, then their use for STARTING is typically a higher priority than for STOPPING. In this case, running up on the toe stops to get up to speed from a dead stop ASAP is the desired result, and both the size and grip of the toe stop is paramount. If the stop's height cannot be set close enough to the floor to allow the foot angle to function for max power transfer then it will be poor. Stop stems that are too short, which do not allow them to be positioned with enough extension to be set optimally close to the rolling surface will compromise performance for fast starts. This setting can also degrade performance for stops as well, especial 180º reverse stops. The deck height of plates and the location of the stop hole threads above the rolling surface will impact the decision of which stops are best matched to a given set of plates. In addition the angle of the stop hole and its nearness to the wheels can dictate what stops are best size wise to avoid wheel bite on the stop. Insufficient grip of stops when doing starts and while running several strides fully up and supported on them, can have the leg thrust force exceeding the traction grip of the stop material, and the resulting slippage will destroy a fast start. So the formula of the stop material has to match well for grip to the skater's typical rolling surface environment(s). So bottom line is that choosing the best stops is going to be a matter of uniquely assessing the particular plate design properties on which they will be used, as well as considering both the running starts versus stopping aspects. Last edited by Armadillo; July 13th, 2016 at 03:39 PM. I think a picture of your skates from the side to show where the front axle sits might help, if the front axle is back toward the junction of the big and index toes...running on the toe stops is really easy and fun, it the axle is far forward, at the knuckle of the big toe, running on your toe stops will be an issue. Length of the toe stop shaft can be adjusted longer or shorter to accommodate, I'd look at what Snyder offers, good urethane, different sizes and different length shafts. Kids........ Who stops for kids?. Bahahahahahahaha. We are the QUORG! You will be assimiskated. Skating Inlines is Futile! Hello JorisKB, Generally I session skate and like to go fast and can stop safely and fast with stops on and maneuver with them. If there weren't people all over the place and I could just roll on, I might not need them but, I like them. Last edited by idiveintoit; July 12th, 2016 at 03:55 AM. Hey GraySk8ter, Just had to mention that your skates look sweet. How do you like the wheels? Assuming speed skates are used for actualspeed skating - as in racing - then no toe stop is the more normal setup. However when a speed skater still deems toe stops to be a necessity, then their use for STARTING is typically a higher priority STOPPING. Armadillo, I really like your descriptive explanation and yes there are quite a number of variables. It is one of many a somewhat challenging topic. I thank you for your reply and if you have any experience with different stops on different surfaces that would prove helpful. Thanks again. Well Ursle, Since you asked, here are my ol 265's on Cyclone plates with Fanjets, Fafnir 8balls and Hugger stops. I'll check out Snyders offerings. Thanks. Last edited by idiveintoit; July 12th, 2016 at 03:52 AM. Reason: Had to add another pic. WJCIV, Hello and thanks. I'll look into the Suregrip cutaways and the Gumball V2? I assume that you mean version 2? I'm a little slow on some acronyms so I hope they're listed a such, but I'll figure it out . Your personal use and opinion are appreciated. My Ol Huggers feel like they need changing to a fresh new stop due to feeling slippery as well as potentially crumble like you mentioned at some unforeseen and inappropriate time. Faster wheels are the only wheel I use. I have several Roller Bones Turbos gathering dust and other assorted wheels I tried. I skated the Faster wide speed wheels for over 18 months and just bought this set of Red, White, and blue hub beauties. They are more narrow and 3mm lower. I have used them for a couple of weeks now and they are great! All American made by Detroit Skate Factory (formerly FasterSkates). 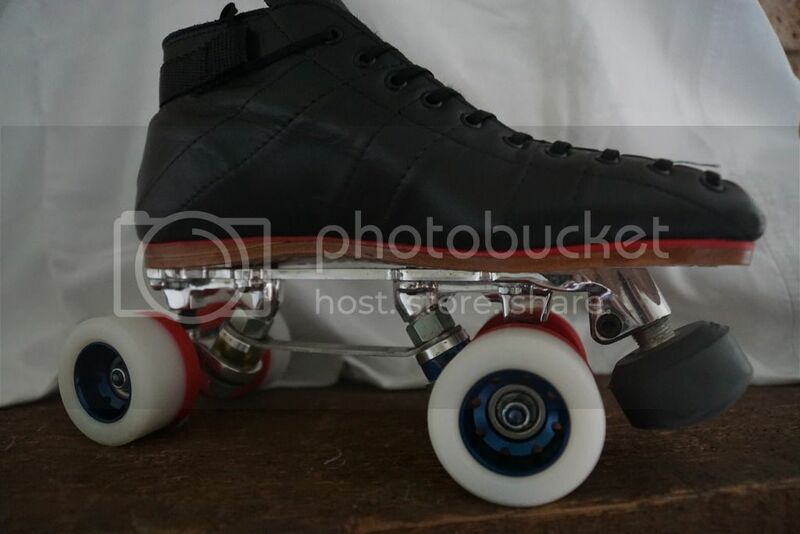 GraySk8ter, This is off topic from my toe stop thread but, I've been eyeing those wheels I have my Ol Fanjets which are shown in a previous part of this thread. If I recall correctly they originally were a somewhat solid white urethane like yours without the red and have turned to a tye dyed butterscotch look in color and seem a little slick, especially when scooting around a corner on a wood floor and doing some footwork to keep on track. How do your red & white tires feel when shuffling around compared to your Naturals?